Here and elsewhere I want to defend the theoretical possibility of attributing causal powers to meso-level social entities and structures. In this I follow a number of philosophers and sociologists, including many critical realists (e.g. Roy Bhaskar, A Realist Theory of Science and Margaret Archer, Realist Social Theory: The Morphogenetic Approach) and also the recent thinking of Dave Elder-Vass (The Causal Power of Social Structures). But I also defend the idea of an actor-centered sociology, according to which the substance of social phenomena is entirely made up of the actions, interactions, and states of mind of socially constituted individual actors. Making out both positions, and demonstrating their consistency, is the work of this paper. I refer to this position as “relative explanatory autonomy” of the meso-level. This topic is of renewed interest because of the current influence and progress of analytical sociology (Peter Hedström, Dissecting the Social: On the Principles of Analytical Sociology; Hedström and Bearman, The Oxford Handbook of Analytical Sociology ; Peter Demeulenaere, Analytical Sociology and Social Mechanisms), which offers an emphatic “no” to the question; whereas critical realists are equally firm in defending an affirmative answer to the question. My defense of meso-level causation is based on four ideas. First, the practice of sociologists justifies this claim, since sociologists do in fact make use of meso-meso claims. 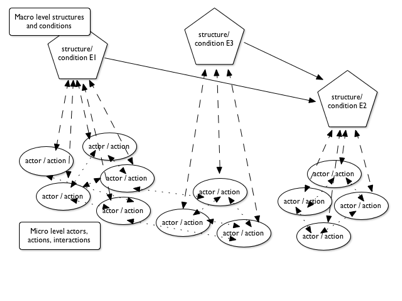 They often do not attempt to provide vertical explanations from circumstances of the actor to meso- and macro-level outcomes; instead, they often provide horizontal explanations that explain one set of meso and macro outcomes on the basis of the causal powers of another set of meso and macro conditions or structures. Second, sociology is a “special science” analogous to cognitive science, dependent on a set of causally linked entities at a lower level. Arguments offered for the relative explanatory autonomy of the higher-level theories are applicable to sociology as well. The basis for rejecting reductionism is well established here. Third, meso entities (organizations, institutions, normative systems) often have stable characteristics with regular behavioral consequences. This is illustrated with the example of organizations. Fourth, those entities must have microfoundations; we must be confident that there are individual behaviors at lower levels that support these macro characteristics. But it is legitimate to draw out the macro-level effects of the macro-circumstance under investigation, without tracing out the way that effect works in detail on the swarms of actors encompassed by the case. The requirement of microfoundations is not a requirement on explanation; it does not require that our explanations proceed through the microfoundational level. It is an ontological principle but not a methodological principle. Rather, it is a condition that must be satisfied on prima facie grounds, prior to offering the explanation. (I refer to this as the “weak” requirement of microfoundations; link.) In short, we are not obliged to trace out the struts of Coleman’s boat in order to provide a satisfactory macro- or meso-level explanation or mechanism. Does the extended social world have causal powers? Here are some reasons for thinking that it does. First, working sociologists offer explanations that postulate meso-meso causal connections on a regular basis. They identify what they take to be causal properties of social structures and institutions, and then draw out causal chains involving those causal properties. And often they are able to answer the follow-on question: how does that causal power work, in approximate terms, at the micro level? But answering that question is not an essential part of their argument. They do not in fact attempt to work through the agent-based simulation that would validate their general view about how the processes work at the lower level. This explanatory framework seems entirely reasonable in the social sciences. It does not seem necessary to disaggregate every claim like “organizational deficiencies at the Bhopal chemical plant caused the devastating chemical spill” onto specific individual-level activities. We understand pretty well, in a generic way, what the microfoundations of organizations are, and it isn’t necessary to provide a detailed account in order to have a satisfactory explanation. In other words, we can make careful statements about macro-macro and macro-meso causal relations without proceeding according to the logic of Coleman’s boat—up and down the struts. So one argument for the relative autonomy of meso-level causal claims is precisely the fact that good sociologists do in fact make credible use of such claims. Second, there is a more general reason within the philosophy of the social sciences for being receptive to the idea of meso-meso social causes. This derives from the arguments against reductionism in a range of the special sciences. The idea of relative explanatory autonomy has been invoked by cognitive scientists against the reductionist claims of neuro-scientists. Of course cognitive mechanisms must be grounded in neurophysiological processes. But this doesn’t entail that cognitive theories need to be reduced to neurophysiological statements. Jerry Fodor introduced highly influential arguments against reductionism in “Special sciences and the disunity of science as a working hypothesis” (link). Once we have reason to accept something like the idea of relative explanatory autonomy in the social sciences, we also have a strong basis for rejecting the exclusive validity of one particular approach to social explanation, the reductionist approach associated with methodological individualism, analytical sociology, and Coleman’s boat. Rather, social scientists can legitimately use explanations that call upon meso-level causal linkages without needing to reduce these to derivations from facts about individuals. And this implies the legitimacy of a fairly broad conception of methodological pluralism in the social sciences, constrained always by the requirement of weak microfoundations. Third, we have good research-based reasons to maintain that meso-level social structures have causal powers. Consider organizations as paradigm examples of meso-level social structures. An organization is a social entity which possesses a degree of stability in functioning that can be studied empirically and theoretically. An organization consists of a structured group of individuals, often hierarchically organized, pursuing a relatively clearly defined set of tasks. In the abstract, it is a set of rules and procedures that regulate and motive the behavior of the individuals who function within the organization. There are also informal practices within an organization that are not codified that have significant effects on the functioning of the organization (for example, the coffee room as a medium of informal communication, or the norm of covering for a co-worker’s absence). Some of those individuals have responsibilities of oversight, which is a primary way in which the abstract rules of the organization are transformed into concrete patterns of activity by other individuals. Another behavioral characteristic of an organization is the set of incentives and rewards that it creates for participants in the organization. Often the incentives that exist were planned and designed to have specific effects on behavior of participants; by offering rewards for behaviors X, Y, Z, the organization is expected to produce a lot of X, Y, and Z. Sometimes, though, the incentives are unintended, created perhaps by the intersection of two rules of operation that lead to a perverse incentive leading to W.
Now we are in a position to address the central question here: do organizations have causal powers? It seems to me that the answer is yes, in fairly specific ways. The most obvious causal properties of an organization are bound up in the function of the organization. An organization is invented and developed in order to bring about certain social effects: operate and maintain a complex technology, reduce pollution or crime, distribute goods throughout a population, provide services to individuals, seize and hold territory, disseminate information. But the specifics of an organization also give rise to unintended consequences; these too contribute to the causal powers of the organization. All these effects occur as a result of the coordinated activities of people within the organization. When organizations work correctly they bring about one set of effects; when they break down they bring about another set of effects. Here we can think about organizations in analogy with technology components like amplifiers, thermostats, stabilizers, or surge protectors. Finally, I too believe that there is a burden of proof that must be met in asserting a causal power or disposition for a social entity — something like “the entity demonstrates an empirical regularity in behaving in such and such a way” or “we have good theoretical reasons for believing that X social arrangements will have Y effects.” And some macro concepts (e.g. State, Islam, market economy) are likely cast at too high a level to admit of such regularities. That is why I favor “meso” social entities as the bearers of social powers. As new institutionalists demonstrate all the time, one property regime elicits very different collective behavior from its highly similar cousin. And this gives the relevant causal stability criterion. Good examples include Robert Ellickson’s new-institutionalist treatment of Shasta County and liability norms and Charles Perrow’s treatment of the operating characteristics of technology organizations. In each case the microfoundations are easy to provide. What is more challenging is to show how these social causal properties interact in cases to create outcomes we want to explain. So how does the micro-macro link look when we attempt to provide the idea of meso explanations with microfoundations? The various versions of methodological individualism—microeconomics, analytical sociology, Elster’s theories of explanation, and the model of Coleman’s boat—presume that explanation needs to invoke the story of the micro level events as part of the explanation. The perspective offered here requires something quite different. This position requires that we be confident that these micro-level events exist and work to compose the meso level; but it does not require that the causal argument incorporates a reconstruction of the pathway through the individual level in order to have a satisfactory explanation. This account suggests an alternative diagram to Coleman’s boat. The diagram represents each of the causal linkages represented in the Coleman boat. But it also calls out the meso-meso causal connection that Coleman prohibits in his analysis. And it replaces the idea that causation proceeds through the individual level, with the idea that each meso level factor has a set of actor-level microfoundations. But this is an ontological fact, not a prescription on explanation.